Advanced System Care: Does the first public beta do enough? IObit has released the first public beta of Advanced SystemCare 5, its comprehensive PC maintenance and optimization suite. The main addition in this release is ActiveBoost, a technology that aims to automatically improve PC performance by "intelligently managing system resources" in real time. Technical details are sparse so far, but we suspect ActiveBoost is tweaking process priorities and RAM use when it thinks this might be helpful. If that's the case then it can be a useful strategy in some situations, but didn't make any noticeable difference to us. Elsewhere, the Quick and Deep Care modules now include even more functions, with tools to detect and remove malware, clean and defragment the Registry, optimize your PCs boot process, clean and defragment your hard drive, detect and fix file system errors, detect missing Windows patches, and more. The Turbo Boost function has been enhanced to recover more system resources; cloud technology helps the program respond more quickly to malware outbreaks; and the interface has received a minor tweak or two, making Advanced SystemCare 5 just a little easier to use. And of course the suite includes the many additional features available in previous versions. So there are tools to fully uninstall applications, securely delete confidential files, optimize your Internet connection speed, undelete files, detect and repair common Windows problems, and more. There are plenty of powerful options here, then, but keep in mind that this is the first public beta of Advanced SystemCare 5, and even IObit warns that "it may do harm to your system". We've installed the suite and haven't run into any major problems yet, but you may not be so lucky. 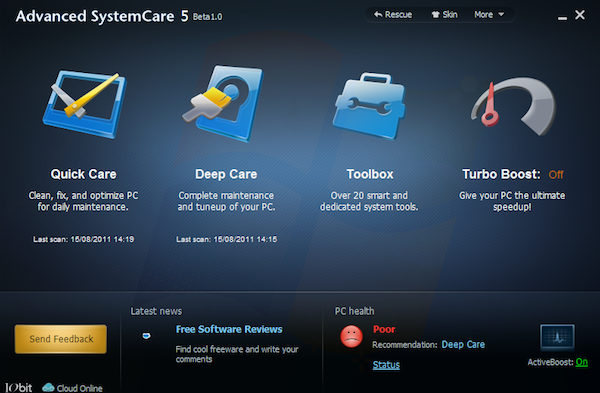 We'd recommend you only try Advanced SystemCare 5 on a system which is fully backed up, just to be safe.